You've reached the intersection where Park Place meets the Yellow Brick Road, so grab your friends and family, click your heels three times and return to the magical land of Oz. 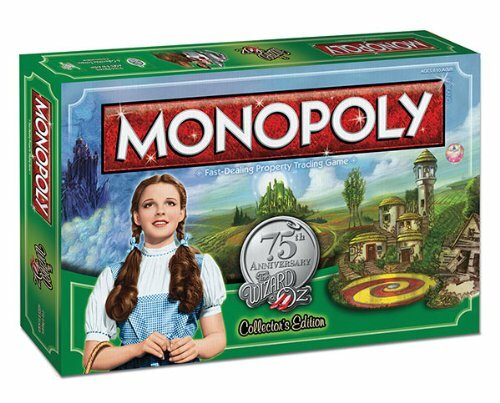 You'll know you're not in Kansas anymore with the world-famous monopoly game. Follow the Yellow Brick Road as you buy, sell and trade your favorite locations in the movie from Home Sweet Home, the Emerald City and the Witch's Castle to the Haunted Forest, Poppy Fields and the Apple Orchard. It's your turn to have your wish granted, the monopoly way! Game includes 6 collectible pewter tokens - Dorothy & Toto, Scarecrow, Cowardly Lion, Tin Man, Tornado and the Ruby Slippers. Ages 8+, 2-6 players.